Dr. K. B. KOTESHWARA Associate professor Manipal University Manipal College of Pharmaceutical Sciences India, continuing research in the specialized scientific area of Possess research experience while doing M.Pharm at Dept. of Pharmaceutics, MCOPS, Manipal. Dissertation work entitled “Design and evaluation of Captopril transdermal preparations” under the guidance of Dr. N. Udupa. b) Possess five year research experience while doing Ph.D. at department of Studies in Industrial Chemistry, Kuvempu University, Shankaraghatta, Shimoga. Work entitled “Studies on some novel polymers for pharmaceutical applications” under the guidance of Dr. Vasantakumar Pai. c) Worked and Guided for PG students for their Research work on (24 projects completed as on April 2015). 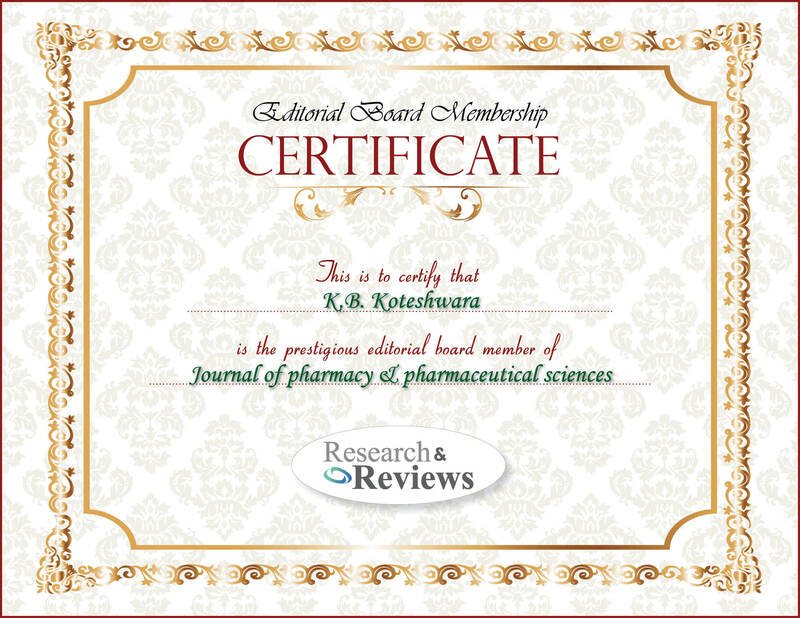 Dr. Dr. K. B. KOTESHWARA is serving as an honorary reviewer for journal of pharmacy & pharmaceutical sciences & other reputed journals. Possess research experience while doing M.Pharm at Dept. of Pharmaceutics, MCOPS, Manipal. Dissertation work entitled “Design and evaluation of Captopril transdermal preparations” under the guidance of Dr. N. Udupa. b) Possess five year research experience while doing Ph.D. at department of Studies in Industrial Chemistry, Kuvempu University, Shankaraghatta, Shimoga.